Most tourists use public transportation when they travel. Tourists can see and experience a country’s atmosphere when they use its own means of transportation. Using local transportation also reduces a traveler’s stress and costs while traveling. Last winter vacation, reporters from The UOS Times visited three countries in Europe: France, Belgium, and Germany. These three countries are located close to one another, but their transportation systems have several unique characteristics. This article will describe the means of transportation in each country, and the authors hope this will be helpful to students who plan to visit these countries. The first country that The UOS Times visited was France, and we stayed in Paris. Since Paris is the capital city, tourists can use various transportation that is well-developed. In fact, most tourists feel the subway, called the Paris Metro, is the most convenient form of transportation. People can find stations wherever they are because there are many routes and stations across the city. The Paris Metro also provides various options when purchasing tickets, which is helpful for tourists since they can choose tickets based on their own specific plans and budget. There are 16 routes in the Paris Metro. Its long history begins in 1900, when the first line started to operate. Due to its advanced age, the subway in Paris is not as clean as the subway in Seoul. In addition, people cannot use their smart phones underground. 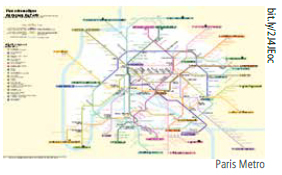 Because of these problems, the Paris Metro plans to remodel all its stations. If you plan to visit Paris, you can expect better subway conditions in near future. According to the plans, there will be more routes and stations. As noted above, there are various options when purchasing tickets. The first kind of ticket is for one-time usage. This ticket is sold for 1.90 EUR. With this ticket, you can use multiple forms of transportation, such as the busses and trams. You must buy this ticket before getting on the subway, but in most subway stations you can only buy tickets with coins, not bills. In stations nearby tourist attractions, such as the Eiffel Tower, people can buy tickets with bills, but this is not common. Therefore, if you plan to use the Paris Metro, make sure to bring plenty of coins. Because this ticket is so convenient, the Paris Metro also sells it in bundles of 10. This bundle is called a Carnet, and the price is 14.90 EUR. This is a little cheaper and more convenient for tourists who plan to use public transportation a lot. There are also special tickets sold on the weekend for people under age 26. This ticket is 3.75 EUR and can be used for the whole day. This ticket is recommended for people who stay in Paris during a weekend. 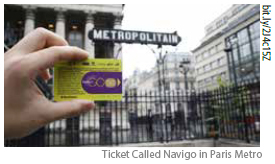 There is also a transportation card for the Paris Metro called a Navigo. If you plan to stay longer or study in Paris, this is a better option than tickets mentioned above. There are options for a day, week, month, and year. However, this ticket is only valid from the day ticket is bought to the Sunday of that week. In other words, if you buy a Navigo for one week on Sunday, you can only use it only on that day. Therefore, tourists have to decide which option is better between individual tickets and a Navigo based on their travel plans. In addition, to purchase a Navigo you must provide an identification picture. Using public transportation helps you experience a country directly. It is also really convenient because it usually covers a lot of places that tourists visit. The UOS Times hopes UOS students have better trips with this information about public transportation.